An optional accessory, the cast iron grill plate rests over any two side burners, locking on to grate to prevent sliding. Once seasoned, fish, lean meat and vegetables can be rapidly seared without added fats or oils. By setting the back burner to “high” and the front burner to “low” a corresponding heat gradient may be achieved. Imagine up to eight tenderloins grilled at the same time…. each finished to perfection! 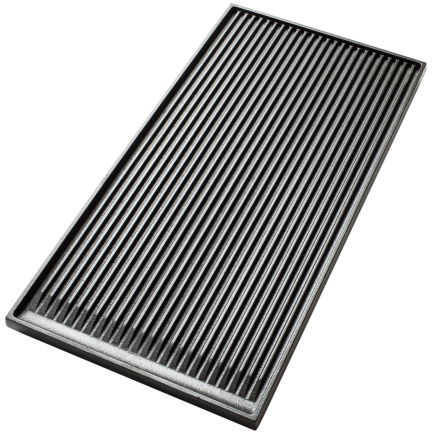 Grill plate dimensions are 20 inches by 10¼ inches.